Occasionally when talking to people about pesticides and chemicals in general I find that some have some knowledge about studies that make all sorts of claims. The reality is that 10,000 poorly designed studies with weak associations filled with weasel words and assumptions (and possibly outright fraud such as the Tulane endocrine disruption study) amount to nothing more than “conclusions in search of data”; and they are not worth one well designed study that is “data in search of a conclusion”. In short….they lie. Lies of commission and lies of omission. As my friend Dr. Jay Lehr says; they don’t get government grant money unless they give these people what they want. Government grant money has turned the term “scientific integrity” into an oxymoron. When science gets rich, it gets political! There are a number of articles I wish to highlight in this post dealing with two issues. Pesticides and IQ, and pesticides and endocrine disruption. In the developed world, where pesticides were used the most IQ's went up over the last fifty years. As for sperm count issues; the knock on DDT was that it causes a loss of sperm count. Even if this was true, it doesn’t seem to much matter even if it was true, because the generation most heavily exposed to DDT was also the generation that created the baby boomers. At the end of WWII the world’s population numbered around two billion people, and it took thousands of years to accomplish that. The world’s population has soared to almost seven billion in less that seventy five years. The reality is this; everything we are told should bear some resemblance to what we see going on in reality. I keep hearing all sorts of claims by activists and government grant chasing “scientists” that chemicals (especially pesticides) cause cancer, autism, low sperm count and a host of other unproven scares. This has been particularly true of DDT. More outrageous claims have been made against DDT than almost any product that has ever been developed, with the possible exception of bisphenol A (BPA) and phthalates. As for claims that there has been a drop in sperm count over these many decades. Gil posted an article dealing with this issue. In one of this week’s Daily Dispatches the American Council on Science and Health cited a study that clearly demonstrated that “the 1992 study by a group of Danish researchers that claimed sperm counts declined by 50 percent worldwide from 1938 to 1991”, was wrong! They point out that the study was “heavily criticized for its many flaws, methodological problems, and biases” at the time. “We know that the so-called decline in sperm count is just another myth promulgated by the ‘our stolen future’ crowd who say that environmental chemicals lead to infertility in men,” says the American Council on Science and Health's Dr. Gilbert Ross. “But now we have proof that’s simply not true.” Michael Fumento also addressed, “Our Stolen Future” in an article in 1999 entitled, Hormonally Challenged. So, do chemicals really cause a drop in sperm count? Although it was obvious for years that all these claims were junk science, we can finally answer with an absolute and resounding; NO! A few days ago I posted an item that I called, This is a Test, and linked another article for everyone’s perusal. The article was a perfect example of how logical fallacies and lies of omission are part and parcel of the green/left movement. She starts out by discussing some psychiatrist’s views on why people aren’t really evil, they just lack empathy. That in itself is logical fallacy, because empathy is a personal quality, while evil requires action. After all, couldn't there be un-empathetic people who don’t do evil things? Couldn't there be people who are empathetic and yet do evil things? Evil, like cruelty, requires action. In order to be evil one has to do evil. The fact that they lack empathy is merely an explanation of why some were able to perform acts of evil, but there really are evil people who do evil things and there is evil done by those who only become evil by their actions. However, were all of the maniacs in the Soviet Union just un-empathetic when they murdered upward of fifty million of their fellow citizens? Not initially they weren't. Bukharin, a founding member of the Soviet Academy of Arts and Sciences, and a founding leader of the Soviet Union (who became a recipient of tender mercies of his personal friend Stalin) said years later that “mass annihilation of completely defenseless men, with women and children" under forced collectivization and liquidation of kulaks as a class that dehumanized the Party members with "the profound psychological change in those communists who took part in the campaign. Instead of going mad, they accepted terror as a normal administrative method and regarded obedience to all orders from above as a supreme virtue... They are no longer human beings. They have truly become the cogs in a terrible machine." Note….”They are no longer human beings.” They didn’t start out will little of no empathy, but they perpetrated evil non-the-less on a scale that even made Hitler seem tame. As for his conclusions that all we need is empathy….reminds me of the Beetle’s song. “All we need is love”….Ok….I can buy into that if we can get everyone to go along. But that isn’t what the world has. I would like to know how much empathy Neville Chamberlain could have shown to Adolph Hitler in order to avoid WWII; remember he tried…..and failed. The same is true of Genghis Khan, Alexander the Great, Julius Caesar…etc. It still comes down to this. Those with empathy don’t need to be taught it and those who don’t have it won’t be taught it. So, if a diplomat, general, attorney, family member enjoys the torment he inflicts on others no amount of empathy by you will fix that. It takes the use of power. And the only power that could impose that level of compassion worldwide would have to be divine force. And these people are not that divine force, and all the socialist swill in the world (which is what this is all about) cannot make it so. It isn' t our understanding that is necessary, it is their understanding that counts.....and they don't care because they have a mission or a goal they wish to attain irrespective of how it affects others, especially if they are socialists. But next comes the primary logical fallacy. Notice how cleverly the writer makes an irrational leap in logic. This article starts out defining crazy people, what they do, and why they do it, and then jumps to corporations so smoothly that it implies that everyone working in the companies of the world must be insane. Just because corporations are artificial entities created by government doesn’t make them psychopaths. In point of fact; they can‘t be psychopaths because they don’t think, they don’t feel and are not self aware. They are a paper creation and don’t really exist except as a financial tool. The decisions are still made by people. And whether the owners of these companies are owners of corporations, limited liability companies, sole proprietorships, partnerships or political leaders it would be immaterial. The primary function of every company is to make profits. That is why people have jobs. That is why governments can collect taxes. That is why countries that practice capitalism have the best life styles in the world for their people. This is base line for being in business. However, companies of every ilk have pumped untold billions into their communities to the benefit of the communities. Why isn’t that mentioned? And those decisions were made in spite of the fact that those billions would not be going to the stockholders as dividends. It is true that companies have abandoned communities, but why was that? Because they hate the local people? NO! They moved or went out of business. Would that have made this writer happier? It really is true; even if you make the finest buggy whip in the world; the world doesn't need that many buggy whips anymore. This business about chemicals and “other toxic substances’ causing horrific damage and injury to the world” is another one of those unendingly repeated lies that have become accepted by repetition, but it still remains a lie. All of these products have been vilified with unscientific horsepucky. The world has been better for all of these products. Regarding all this talk about slave labor and all that goes with it, I don’t know about some of this either way, but I will take a stab and say that this is probably true if you compared their circumstances with the American lifestyle. However, is it better or worse than their fellow countrymen? In point of fact, in most of these cases where these outrageous claims are made we find that they are happy to have these jobs. And when the adverse publicity forced owners to abandon production facilities in these countries these people were left without any income. As for the Firestone issue; that isn’t as cut and dry as it seems. First of all this report was based on observations from some Non Governmental Organization (NGO) labor rights organization, and that in itself makes one wonder at the truthfulness of the report. Wow….somehow I think that was germane to the subject….don’t you? I wonder why they left that out? The problem with greenies and the lefties is that they lie! Lies of commission and lies of omission. These were jobs these people might love having, and most importantly, needed. Stop comparing American wages, living conditions and circumstances with those people living in countries that are poverty stricken by our standards. That is a logical fallacy….and helps perpetuate the big lie. As for all the accusations about murder, slave labor, etc. this would be unacceptable under any circumstances. Not one conservative pro-corporation person I know would accept that. Just because some people from some company does terrible things (and that we're just supposing that any of this actually did happened) does not justify painting all companies and their people with that same brush. As for Chiquita giving money to right wing and left wing terrorists groups; I remembered when this happened because at one point I was following the stock. The fact is they were paying off all of these groups in order to protect their employees. I wonder if they would be under attack by these groups if the only ones they paid off were the left wing terrorists. And it's clear the local government sure couldn’t protect their employees, including the U.S. Justice Department which fined them. Just like the mob they were extorting everyone, including Chiquita. So tell me, since the government couldn’t or wouldn’t protect their people - what were they to do to protect them? What would you do? In the U.S. extortion is a crime by the exporter, not the extorted. If they are doing illegal things then arrest them, try them and punish them, but let’s stop this delusional claptrap, this has nothing to do with corporate empathy. Corporate empathy cannot exist because corporations aren’t real. People are real and people make those decisions. And those decisions are not always based of profit motives! This so-called corporate machine that needs to be “put to rest” has brought more people out of dystopia than any system the world has ever known. All of this socialist horsepucky is nothing more than an outrageous diatribe against capitalism. Socialists have failed time and time again to provide the basic needs of their people. Food shortages have been a mark of socialist states from the beginning, along with terrible living conditions, and at times they were deliberately starved to death. The death toll by socialist’s states of its own people ran up to 100 million deliberately killed by their own governments. The only group that could be held more accountable for crimes against humanity would be the environmental movement. Furthermore, socialist’s states have been absolutely devastating to the environment. China and Russia are primary examples of environmental devastation - all done in the name of the people. Not profit. Companies who work for profit in capitalist countries do so in an environment where they can be held accountable for their actions, and often are, and rightly so. But legitimately run companies for profit are not the problem, they're the solution. I find it interesting that the article starts out with a cry for empathy and claims that corporations are not really evil. Then the author ends with a condemnation of every businessman in the world for being evil. Typical left wing inability to be truthful or consistent. This diatribe is a logical fallacy from start to finish. To recap my earlier points, here is the reality that they always miss. Companies are in business to do business not to do good. If they do good business they will make profits. Those profits are distributed and then everyone can take their profits and do whatever darn good they wish to do, and often do. Even if they wish to be keep the money for their own uses exclusively….they are giving back to the community by spending that money on food, dining out, movies, clothes, houses, boats, cars, etc. And every dime goes directly back to members of the community who will then decide for themselves how to spend that money to their benefit, just as the owners of successful companies did. This will be accomplished without having huge chunks taken out be some government bureaucrat who will then decide how the rest is to be spent. Or perhaps I should say wasted by socialist bureaucracies. The result has been this. We are living longer, healthier, and happier lives than any time in human history because of capitalism. Period! Get over it! Why do anti-aviation group Plane Stupid, and perennial hippie hangout, Greenpeace hate Gaia? Both Greenpeace and Plane Stupid celebrated when Heathrow airport’s planned third runway was cancelled, in part because of protests led by their merry bands of gap-year student activists who climbed all over things that didn’t belong to them. Greenpeace and Plane Stupid wants to save the planet from airlines, but it’s a cosmic rule that hippie action is always met by the equal and opposite force of unintended consequences. Sixty per cent of arrivals into Heathrow Airport are caught up in holding patterns above the capital, at a massive cost to the economy and great frustration to passengers. Figures compiled by air traffic control service NATS have revealed that jets circling for a cumulative 55 hours a day are burning 190 tons of fuel and discharging 600 tons of co2 into the skies above London, costing £119,000 in wasted fuel every day. You have to change a lot of light bulbs to save 600 tons of CO2. If the planet was a living, breathing organism capable of sentient thought, it would probably shake the hippies off like so many fleas, just to save itself from the stupid. Take that, Gaia! My Take – This statement has been shown to be imminently true. You can’t fix stupid! Every dollar spent complying with federal regulations returned anywhere from $2.13 to $14.90 during the 2000s, according to a new report from the White House Office of Management and Budget (OMB). EPA rules accounted for approximately 84% of this alleged regulatory largesse. Needless to say, the OMB report is total nonsense. First, the OMB report is not a re-analysis of costs and benefits claimed by federal agencies or a retrospective analysis of actual costs and benefits. The report simply parrots and adds up what the hallucinatory agencies have previously claimed. In particular and as we pointed out in “EPA’s Clean Air Act: Pretending air pollution is worse than it is,” EPA benefits estimates are LOL-ably wild, if not entirely imaginary. It’s really sad that OMB — once a respected champion of cost-benefit analysis — has been reduced by the Obama administration to bootlicking arithmetic. "With this case, the Supreme Court confronts important issues for property rights and due process. When the government seizes control of your land, and you disagree with the justification, shouldn't you be allowed your day in court? Just as important, should EPA be a law unto itself, without meaningful accountability to the courts and the Constitution?"…….. And it's not just the Sacketts' land that could be subject to such orders. The foundation arguments suggest that private property across the nation could be at risk. The legal team noted that between 1980 and 2001, the EPA issued up to 3,000 compliance orders every year across the nation. "The reality of the Sacketts' situation is that they have been unambiguously commanded by their government not to complete their home-building project, to take expensive measures to undo the improvements that they have made to their land, and to maintain their land essentially as a public park until the property is 'restored' to the satisfaction of the EPA. They have been threatened with frightening penalties if they do not immediately obey; but they have been refused the prompt hearing they should have received as a matter of right in any court," Pacific Legal argued. I have linked an article below for your perusal...Is this article factual? Is this article logical? Is this article filled with logical fallacies? If so, can you find the logical fallacies in this article? If there are logical fallacies in this article, can you develop an intellectual response to these accusations? I think this guy is a bit of a loon, but he has interesting stuff on his site, and I like reading this stuff in order to keep my mind alert. I would also like to add....he is “right on” occasionally, causing me to adjust my perspective. Also I read the articles on his site because I don't find as many issues presented as interestingly elsewhere, and he is prolific....daily! You must read the other side if you wish to develop the intellectual responses to their attacks. It also makes recognizing logical fallacies easier. The more we do this the more we find that the patterns of argumentation repeat over and over again. The same logical fallacies are used over and over again. The key is spotting them; once that happens the response will follow easily. There is one caveat though. We have to read. The answers cannot come if we don’t have the information tucked away in our brain. These kinds of exercises merely train our minds to utilize what is there; if it is there. We have to read. Both sides! The other thing that we will learn is that both sides leave stuff out. Find out what that stuff is and why it has been left out and an honest hearted person will have the answer. Get the history…the complete history….. of any issue and you will have the answer. (NaturalNews) Corporations play a big role in our day-to-day activities and they are constantly making decisions that have a profound effect on our daily lives. For example: a corporation makes the decision to empty its chemical vats into a nearby river - the water supply is poisoned and residents of the adjacent town fall sick; or a corporation makes the decision to cut costs to increase profits and initiates a round of layoffs - the community that was formed around the corporation is decimated. We have often been appalled, angry, and go on rants about the evil of corporations but according to Simon Baron Cohen- evil is not the issue. My Take - I know, I know....there is no such thing as a conspiracy. I hear this often and I wonder who was the first person to coin that phrase. Then I wonder if they ever read a history book. Are Current Risk Assessments Worth The Risk? By the mid-1980s, most serious hazards to the environment in the First World had been addressed. As such, government agencies around the globe faced a big problem. What could they now focus on, to maintain—or even increase—their mission and budget? And suddenly, the inspiration came, perhaps as a direct revelation from Gaia herself: The agencies would now focus on the risks (mainly of getting cancer) created by thousands of common chemicals. The brilliance of this strategy cannot be overstated. People are afraid of cancer, and with good reason. In the United States, 44.29% of males and 37.76% of females will contract the disease some time in their lives, with 23.20% of males and 19.58% of females dying from it. Thus, labeling a chemical as "carcinogenic" is sure to garner plenty of attention, and make those Congressional budget reviews so much easier. My Take - I think that it would be worthwhile to read An Interview With Dr. Jay Lehr, which appeared in The Standard, the quarterly newsletter of the Ohio Pest Management Association. Ideas matter, particularly when colored by religious fanaticism, wreaking havoc even in the most favored of places. Take, for instance, Iran, a country blessed with a rich heritage and enormous physical and human resources, but which, thanks to its theocratic regime, is largely an economic basket case and rogue state. Then there’s California, rich in everything from oil and food to international trade and technology, but still skimming along the bottom of the national economy……California was home to six of the ten regions where the economy is poised to get worse. One would think, given these gory details, California officials would be focused on reversing the state’s performance. But here, as in Iran, officialdom focuses more on theology than on actuality. Of course, California’s religion rests not on conventional divinity but on a secular environmental faith that nevertheless exhibits the intrusive and unbending character of radical religion. At first blush, the notion of trade shows seems quite difficult to reconcile with this current era of Internet-enhanced media. After all, these events are said to date from medieval times, and are even referenced in the Old Testament. The point being, of course, that absent mass communications, there was a real need for merchants and customers to get together—face-to-face—to do business, and introduce each other to new products and new requirements. With the advent of reliable mail service and the telephone, applications could be discussed, followed up with submissions of product literature and quotations. With the mid-1980s came the wide availability of fax machines. Thus, documentary communications between buyer and seller became virtually instantaneous. As such, many marketers—and printing companies—wondered how much longer traditional product catalogs, let alone trade shows, would exist in their present form. My Take - Is there anything more embarrassing to normal people than watching people who don’t really believe any of this green crap trying to be “Greener Than Thou” to impress those who hate them, i.e., the greenies. How could anyone who is normal be a part of this movement? This is the fact of the matter….if you want to go green you are irrational and misanthropic. That is abnormal. Alan Caruba has created The BPA File blog, which will show a series of six articles clearly demonstrating how this issue has been pushed by the green movment and their allies. This is another anti-chemical campaign that is just as dishonest, unscientific and detrimental to mankind as was the campaign aganst DDT or even Alar. Junk science, junk scientists, and a green movement that must be insane to continue down the path they are taking. I am not sure what Alan's long term intention is for this blog, but it is hoped that he will continue to expand on this topic. This effort by the green movement is another outrage against humanity. We, as a society, need to start getting this; "to be green is to be irrational and misanthropic". Legislators and regulators need to stand up on their hind legs and become the men of old....as we once were. It was one thing to be gulled by the green movement in 1972, but we know better now. It is no longer a matter of scientific ignorance; it is a matter of courage to stand up and do the right thing! It is my hope you will share this series and the information it contains to help stem this pernicious assault on the safest packaging on Mother Earth, made safer yet by the use of Bisphenol-A. In an attempt to do justice to the ACSH’s efforts I have tried to improve my presentation of their work each week. As time goes by I will find what I believe is the best presentation in order to make sure the issues are clearly and completely outlined in a manner that is user friendly. I have often said that I would like to explore and expand my presentations on a host of issues, but I have a job that interferes with my life. Soon I hope to have more time as I pass my 65th year. One of the things I would like to do is organized an ACSH page by topic. As an example I would like to have a page that is devoted to all the cancer articles for 2011 and so on. But….that is for another day. It is also my hope that Paradigms and Demographics will become a source blog on all of these subjects. I do believe it is important to have a source that is only interested in the facts and prepared to publish them…..with an eye to consistency of thought and devotion to the truth….something the activists have difficulty with; along with their allies in the media. There are so many great writers and sites out there that is it a shame not have all of their works organized in this fashion. I have attempted to do this with the page I have titled, Caruba’s Corner, Green Myths and Other Lies. There are a number of writers that have been graciously allowing me to republish their works, including Gil Ross and Elizabeth Whelan from the American Council on Science and Health. At some point in the near future I wish to do an article about all of these people, which numbers around fifteen or so. Speaking of cancer, the American Cancer Society announced some good news on Friday: Cancer death rates are continuing to decline and, best of all, new cases of lung cancer among women are falling after having steadily increased since the 1930s. A new study published in the Journal of the American Medical Association finds that, among prostate cancer patients, current smokers have an increased risk of prostate cancer mortality compared with non-smokers. Will a picture be worth more than just words on a warning label? The FDA's proposed new graphic warning labels on cigarette packs are causing a stir among pundits and, of course, tobacco companies. Ladies and gentleman, boys and girls: there are obesity updates for all. Can surgery cure diabetes? Maybe — for a while, at least. In other weight loss news, one of the authors of a new study recommends that weight loss surgeries, such as gastric bypass and gastric banding, become front line type 2 diabetes treatments. Readers who turn to ABC as their source of news will get a very skewed impression of distinguished professor Dr. David Allison, head of the Section on Statistical Genetics at the University of Alabama and director of the National Institutes of Health-funded Nutrition Obesity Research Center. A bipartisan bill introduced to Congress by Georgia Republican Phil Gingrey - the Generating Antibiotics Incentives Now (GAIN) Act - attempts to spur interest among pharmaceutical companies to develop new and effective antibiotics, traditionally an unprofitable sector of the drug market. My Take – Is Greed Good? The article goes on to point out the “profit motive” is the key to all of this. When I was in New York last September for the premier of 3Billion and counting I had an interesting conversation with a young woman regarding this issue. My point was then and it is still today. You can’t keep allowing these socialists nations to force the pharmaceuticals to give them the products for free. Some have even demanded that they turn the patent and process over to them so that they can manufacture the antibiotics themselves. They may be able to convince everyone that this is for the common good, but it is absolutely a long term detriment to humanity. Does anyone ever ask; why aren’t these socialists coming up with the new drugs themselves? The U.S. has been the leader in this kind of research for years because they can recover their costs and make money in America. We need to get that if we expect to see more and innovative pharmaceuticals come to the market. Remember….no matter how much these products cost today….they will eventually go out of patent and become public domain. That is the purpose of patents. Get the products to market….and it will only happen if they are allowed to profit from their efforts. The left calls this Greed. I call it enlightened self interest. This is the seed that makes everything grow. Did We Get That? The Supreme Court handed down a decision yesterday that represents a significant victory for the pharmaceutical industry. Must we really take our (multi)vitamins? ACSH staffers this morning lauded Los Angeles Times writer Elena Conis for her comprehensive and informative article on the many benefits of food irradiation, an effective yet underused method of preventing food-borne infection that has been around for the last century. My Take – I keep hearing activists make the claim that there is no safe level of radiation. Horsepucky! That is a blatant lie and they have to know it. The Annual Meeting of the American Medical Association (AMA) has resulted in the Association's adoption of a bevy ofnew public safety policies that have little (or nothing) to do with the actual safety of the public. Ever since the FDA finally approved silicone gel breast implants in 2006, the procedure has grown in popularity; nearly 400,000 breast enlargement or reconstruction procedures were performed in the U.S. in 2010 alone. Writing in today's New York Post, ACSH's Dr. Josh Bloom points out a troubling trend that may be hindering America's ability to compete globally on the scientific front: science jobs are quickly vanishing in the U.S.
My Take - This must explain why there are so many junk scientists out there. So many of the good ones left! ACSH staffers were pleasantly surprised to find an op-ed in the Los Angeles Times underlining the scientific illiteracy and irresponsibility of the anti-pesticide scare tactics consistently used by the Environmental Working Group (EWG) in their semi-annual Dirty Dozen reports. Some of the measures being considered and employed are to limit the amount of fossil fuels being used for the production of electricity and for transportation. The United States derives about 50% of its electrical energy from coal and another 20% from natural gas. Crippling these energy sources obviously will cripple the United States economy and millions of jobs in those companies using the electricity. We learned in World War 2 that a nation can be crippled or destroyed by crippling or destroying their energy production infrastructures. “Isn’t the only hope for the planet that the industrialized civilizations collapse? Isn’t it our responsibility to bring that about?” – Maurice Strong, head of the 1992 Earth Summit in Rio de Janeiro and Executive Officer for Reform in the Office of the Secretary General of the United Nations. This horrendous statement reminds one of the recent statement by Barack Obama calling for the limiting fossil fuels and the resulting skyrocketing costs of US energy costs. Many nations have recognized the importance of electrical energy is the development of their economies and the advancement of prosperity in their nations. China builds a large new coal plant per week, and now has some 20 nuclear power plants under construction. It has also recently completed the largest hydro facility in the world at the 3 Gorges site. Other nations have recognized the importance of large supplies of affordable energy in that some 67 new nuclear plants are currently under construction around the world and that many more are in final design. So who are these international leaders and energy experts with so much contempt seeking to oppose reliable sources of low cost energy in the US? Who are these leaders in the UN, the IPCC, the EPA, the White House, and elsewhere so hell-bent on crippling the US economy and much of the developed world? The answers are emerging. Why the deceit and deceptions about climate evidence? Lorne Gunter writes in the National Post about the IPCC using environmental groups’ literature to bolsters its major publications. For example, in 2009 and 2010 it was shown that the UN’s (IPCC) had included questionable data on Himalayan glacier melt in its major 2007 climate assessment report and that it had done so deliberately to provoke government leaders to speed up environmental legislation. In other words good science be damned, what the IPCC wanted was the science fiction of glaciers melts, not sound science. By the end of March 2010 evidence had shown that at least 16 claims of impending climate doom in the IPCC’s vaunted 2007 report had been based on work done by environmental activists, most of which had not received independent reviews before being swallowed whole by the UN climate body. For instance, the IPCC’s insistence that up to 40% of the Amazon rain forest was under imminent threat came from a World Wildlife Fund-International Union for the Conservation of Nature joint report written by a scientist-consultant and a freelance environmental journalist. These processes have nothing to do with science; they have nothing to do with honesty, nothing to do with sound defensible science policy. They have a lot to do with low-grade uninformed environmental advocacy being involved with international energy policy. More recently Christopher Booker of the Telegraph learned more of the poor science coming from the IPCC. A very large climate report was released recently by the IPCC which was filled with outlandish claims regarding green energy. What only came to light when the full report was published last week was the peculiar source of some of the extraordinarily ambitious claims. It was based solely on a paper co-authored last year by an employee of Greenpeace International and something called the European Renewable Energy Council. This Brussels-based body, heavily funded by the EU, lobbies the European Commission on behalf of all the main renewable industries, such as wind and solar. The chief author of the Greenpeace paper, Sven Teske, was also a lead author on Chapter 10 of the IPCC report, which means that the report’s headline message came from a full-time environmental activist, supported by a lobby group representing those industries that stand most to benefit financially from its findings. Greenpeace adds nothing to the serious debate of future energy supplies or climate change yet here we have the IPCC letting Greenpeace have complete access to its reports. In fact the presence of Greenpeace advice in these IPCC pages diminishes and destroys the credibility of the IPCC. See for example, this link. Let us examine some of the words of the founder of Greenpeace, Patrick Moore. Greenpeace can hardly be considered expert in science let alone in energy policy. As Patrick Moore told me, they aren’t very interested in humans either. They are environmental hacks with financial interests in generating and spreading their nonsense with the full force and support of the IPCC, UN, and US agencies. In a recent report Dennis Ambler describes in detail many of the personnel relationships between the IPCC, the EPA, and many of the contractors shared by each of them . Ambler also provides some of the academic credentials of many of the people involved. Many do not have serious scientific credentials let alone in the highly specialized science of the new discipline of climate. This is not the place for looking for solid scientists or science literature and expertise. Who are these people? David Lundgren has recently written that American leaders such as NOAA administrator Jane Lubchenco still regard the IPCC as the “gold standard” for climate science. American leadership, both state and federal, seems incapable of separating sound science from political hearsay. They threaten the future economy of the US, our liberties, our freedoms, and national security. As a result our nation remains in great peril. Labels: Collusion, Corruption, EPA, GW, IPCC, Michael Fox, NOAA, Scientific Integrity, UN. "The end of green ideology"
It is interesting to note, that you can read professor Sorman´s outstanding article in the China Daily, not in any of the major English language western newspapers. No, a sober, realistic and positive analysis like this, is not welcome in the politically correct mainstream media, which are more than happy to publish every piece of rubbish, written by ignorant enviro-fundamentalist scaremongers. The end of the green ideology will, as an added bonus, also lead to the end of the global warming religion. On must only hope that this happens sooner rather than later, in order to avoid the wasting of the huge sums of money that many of the present western governments now are planning to use in order to fight imaginary human-induced warming. My Take - At some point the negative impact of greenie ideas and impositions on society will have an impact on societies thinking. The green movement by its very nature is irrational and misanthropic. At some point even the false media will not be able to paint a positive picture about them. Dystopia follows the green movement like the plague follows rats. If that is the case everywhere else in the world, why would be think it would be different here? In a lawsuit filed Tuesday in Washington, D.C., a group claims NASA is withholding documents that show James Hansen failed to comply with ethics rules and financial disclosures regarding substantial compensation he earned outside his $180,000 taxpayer-paid position as director of the Goddard Institute for Space Studies. My Take – One of the slick ways these people divert attention from what they are doing is to accuse others of perpetrating the very corruption they are practicing. Once again; their attack was that deniers were in it for the money, and on the payroll of multinational corporations. As all of the anthropogenic climate change information has come to light we have discovered the level of corruption with these people is staggering, from scientific fraud and bullying to personal financial gain. Global warming and government grant money has made the term “scientific integrity” an oxymoron. What we are trying to determine is whether NASA approved Hansen's widespread, well-documented, high-profile and, it runs out, extremely lucrative "outside employment and other activities", permission for which must be obtained in writing, in advance. …………Another example comes from Dallas, Texas, where the city enacted an ordinance limiting window signs for retail businesses to 15 percent of the window area and no sign may be in the upper two-thirds of a window. The statute also prohibits signs that cover more than 25 percent of a building façade. The Institute for Justice filed a lawsuit on behalf of a few businesses, but the city played hardball and threatened those retailers with fines of $300,000 if they didn’t drop the suit. The word extortion definitely comes to mind. On June 28, the Food and Drug Administration (FDA) will hold a hearing to decide the fate of Avastin, a drug taken by thousands of women fighting late-stage breast cancer. Many of these women have pleaded for continued access to the drug, which they consider a matter of life and death. But this case is really about what will guide decisions on treatment options — the best judgment of doctors and their patients, or the policy preferences of the FDA……Avastin is expensive: $56,000 to $96,000 per year. The expected value of treatment for any given patient—the abstract "median"—seems small, so a private health plan may understandably balk at paying such a tab. But cost-effectiveness calculation isn't the FDA's job, and in fact the law forbids the agency from considering anything but a product's safety and effectiveness while it's evaluated. What is the logic of keeping terminally ill patients from potential treatments? Can't they at least go down fighting? My Take - I deliberately linked these articles because I am working on an article that I have in mind calling "The Bed Bug Commissars" and this helps lay the ground work for it. The number one thing as to what constitutes socialism is the idea of central planning and that "we" know best for everyone. It might be noted that there have always been food shortages everywhere socialism is dominant because of their central planning….and of course it is never the fault of "the plan", it is everyone else's fault when the "plan" fails. Well, the principle applies in almost every area where a few well educated bureaucrats who are usually seriously impaired by a lack of life experience, (and politicians who suffer from the same malady) are making decisions that have long term consequences and from which they pay no penalty for being wrong. After all...."their intentions were good". Central planners, no matter how intelligent, are incapable of making the billions of decisions that are needed daily to make any large system work. That is why capitalism has always succeeded everywhere in the world it has been practiced and why socialism has failed everywhere in has been practiced in the world. The only ones who benefit from central planning are the planners, who have the tendency to be corrupt for three reasons, (1) they never seem to be able find a regulation they can't fall in love with, (2) they never seem to run out of the "need" for more regulations and, (3) it turns them into arrogant ego driven bullies. Furthermore, in spite of their claims of concern about people....they only care about power. History is replete with examples that demonstrate the desire humans have to dominate the lives of other humans. That is history....and it is clearly what we have seen in reality, and that is what bureaucracies do. That brings me to the "plan" proposed by EPA to rid the nation of bed bugs. That will follow in another article. This has been recycled from John Ray's GREENIE WATCH blog. John Ray sent the html for this some time ago and I have been waiting for just the right ariticle to attach it to. This article seems to to fit the bill perfectly. I would like to thank Mr. Milloy for allowing me to republish his work. I particularly enjoyed this commentary on this ruling because Steve answered the questions I have been asking to myself regarding the judges and the nuances of this ruling, which seemed to be missing in the news reports. As usual.....he picked up on all of that. If you read any other commentary on this ruling or not, make sure to read this one. RK This originally appeared here! The Supreme Court dealt Al Gore, the Environmental Protection Agency and other believers in alarmist climate science a surprising and severe blow this week. In its June 20 decision on American Electric Power v. Connecticut et al., the court ruled that the mere existence of EPA regulatory authority over greenhouse-gas regulations pre-empted lawsuits against coal-burning utilities on the grounds that the emissions constitute a public nuisance. In its 2007 decision Massachusetts v. EPA that was authored by the very liberal Justice John Paul Stevens, a bare majority of the court (all the liberals plus Justice Anthony Kennedy) embraced Al Gore-type climate alarmism in ruling that the EPA could regulate greenhouse gases under the Clean Air Act. But what a difference a science scandal apparently makes. In its first climate decision following the 2009 Climategate scandal and its progeny – i.e., Glaciergate, Rainforestgate, Pachaurigate, NASAgate and other climate science-related scandals – the court retreated to neutrality on climate science. The court’s plainly written, jaw-dropping about-face is hidden in a footnote and so hasn’t been reported in media accounts of the decision – but it is of significant consequence. 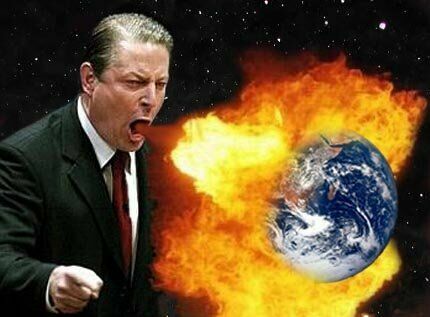 Climate alarmists can no longer claim that the Supreme Court has validated the science of climate alarmism and ordered the EPA to regulate greenhouse gases. If there was any doubt before, the court has now unanimously shifted the blame for destroying the economy with carbon regulations to the Obama administration. This decision has 2012 implications, as well. The winner of the presidential election will be fully in charge of the EPA and the decision whether the agency regulates greenhouse gases. If re-elected, President Obama most likely will keep the pedal to the metal in order to accelerate EPA control of America’s economy. A Republican president will have the option to roll back the EPA’s junk science-fueled regulations or to do something in between. No Republican candidate yet has indicated what they would do about the EPA’s job- and economy-killing greenhouse-gas regulations, though Rep. Michele Bachmann and Newt Gingrich have courageously called for the abolition of the EPA. At the very least, the EPA’s greenhouse-gas regulations should be rolled back as part of a complete rethinking of environmental protection policies and practices. In the more than 40 years since President Richard Nixon merged the various federal environmental programs into the EPA, our environment has become about as generally pristine, clean and safe as makes sense. This is not about rolling back meaningful environmental protection so much as it is about rolling back harmful overregulation. By making us poorer, today’s overregulation eventually will hurt the environment and public health more than past emissions of anything ever did. Now that the Supreme Court has removed its imprimatur from EPA’s attack on America, Republicans should exploit the moment to save our economy from an out-of-control agency. In business, as in life, there has to be short term goals, medium range goals and long term goals. In is important to avoid messing up your long term goals in order to meet the short term and medium term goals. It is avoided by having vision; in other words; being able to see farther down the road than the tips of your toes. One of the things I have been disturbed about over the years is the short term thinking of people in decision making positions in business. Many years ago I read a management book that discussed this very topic and used a life example to show how foolish short term thinking is. The writer cited a situation where a division manager was told that he would probably be let go because his last quarter figures were so bad. So in order to fix that problem he laid off a large number of people, just two weeks before Christmas. What were the results of this action? He was hailed as a great manager by company executives. However, the employees took this personally and were so outraged that they voted in a union. You see, one of the things that kept this company profitable was that there was no union. Now everything changed! The company eventually went out of business a short time later because of this little piece of short range planning and lack of long range vision. This “hero” manager lost his job and lost everyone else’s job also. But he wasn’t alone in this. His bosses were as clueless as he was. It has always appeared to me that in order for this kind of short range planning without long range vision to exist it must be endemic in any system in which it occurs. If there ever was a movement that was rife with this kind of disastrous thinking - it is the green movement. Green is a feel good concept that is bereft of vision; or is it? Perhaps we merely can't conceive of their kind of vision. Let’s take green energy as an example. We currently rely on carbon based fuels such as coal, oil, natural gas and large percentages of electricity are generated by nuclear power. Which one of these forms of energy do the greenies support? Well….none of them. They have always been against coal, oil and nuclear as far as I can tell, but supposedly natural gas was acceptable to them as “clean” burning. Then came the false notion of anthropogenic global warming caused by the burning of carbon based fuels; then natural gas became evil. Some in the green movement then decided that since nuclear didn’t have any kind of exhaust system it was just fine now. That of course changed again because those in the green movement that supported nuclear were called traitors to the planet and were figuratively burned at the stake. So then what are they for? They loved wind power. Then it was discovered that the blades were killing bats and birds at a frightening rate, including endangered species. So now there is a growing movement by the greenies to ban wind energy. So now they hate wind power. They loved solar energy. Then it was discovered that the amount of land needed to generate enough electricity would be staggering and it would interfere with some species of turtle. So then they hated solar power too. They adored ethanol. Then it was discovered that this was causing serious problems. First there was the increase in the cost of food all around the world. Then there was added run off of pesticides and fertilizers into the streams and rivers, not to mention the pollution run off from the production of ethanol. It was more expensive, gave less mileage and was detrimental to the engines. All of which would have a long term impact on the environment. Finally it requires huge acreage thereby reducing wildlife habitat everywhere in the world. So then they hated ethanol. Furthermore none of these so called green energy solution are economically viable without huge outlays of government money in the form of subsidies or tax benefits or both. So what is their solution? They don’t have one! So then, since they are clearly clueless; do they really have short term goals and long range vision? Yes they do! In the short term they want to get rid of everything that makes modern life possible, such as abundant inexpensive energy, pesticides, modern scientific agriculture, vaccinations, cars, dams, highways, etc. This will in turn give them their goals in the long run. They want to eliminate 90% or more of the human population and return to nature. There can be only one conclusion; the green movement is insane….and evil! So that leaves one more question. How many of us have jumped on to that arrogant, green, feel good about myself because I am morally superior to everyone else bandwagon? To be green is to be irrational and misanthropic! My Take - Dr. James Marusek, a retired nuclear physicist and engineer has allowed be to republish much of his work on this issue. Please follow these article for more information on this subject. "Malaria transmitted by mosquitoes kills hundreds of people in Uganda daily - that's why the government there uses the insecticide DDT. But the use of the pesticide has grave consequences for people living out in the countryside: Suppliers of organic foods are no longer able to sell their products, and now they are threatened by abject poverty." My Take -You may wish to explore this E coli outbreak in Germany as a result in the use of “healthier” organic foods. "Organic farms fell under suspicion in the investigation because they do not use chemical fertilisers and put crops at greater risk of contamination from bacteria in manure. The cost to European farming could reach €500m." "The new strain of E coli causes disease by colonising the gut and producing a toxin called Shiga. Many patients experienced bloody diarrhoea and in the most serious cases the infection caused a life-threatening condition called haemolytic uraemic syndrome (HUS)." Not only is ‘organic’ more expensive, but it does not deliver better nutrition, and it is potentially deadly….and this has happened in other areas of the world. Can this happen to traditional farm produce. Sure, but they didn’t go around making outrageous, unfounded claims against the “organics”. Now, with all the facts being in….any claims against the ‘organics’ aren’t unfounded. Why can’t we get that? ………….This nonsensical yearning for the Good Old Days of naturally bleak weather, famine, and the Black Plague has its roots in the near-religious myth that anything humans do to affect the natural course of Mother Earth is evil and wrong. • Few will dispute that the naturally occurring Medieval Warm Period was good for the human condition and the biosphere. • Few will dispute that the naturally occurring Little Ice Age was harmful to the human condition and the biosphere. Yet when evidence suggests humans are contributing – in whatever small measure – to the Modern Warm Period that has rescued us from the depths of the oppressive Little Ice Age, not only Big Government liberals but many self-professed Small Government conservatives tell us we need to do everything possible to restore the climate to The Natural Condition of the oppressive Little Ice Age. The Shame of the American Meteorological Society ……….